CIUDAD TRUJILLO. DIST, DE SANTO DOMINGKO, R. D.
President of the Dominican Republic. A~~t YEAR ago today this great Hall of your National Palace witnessed the signing of a memorable and unique Covenant between your Government and the Association for which I have the Honor to speak. Those who then assembled here were deeply moved when I announced Generalissimo Trujillo's contribution of his magnificent Sosua estate to enable us to launch this work for oppressed, refugees whatever their race, religion or national origin. Throughout the world men of good will applauded. President Roosevelt declared that at last "a constructive turning point in the history of refugee work" had been reached. So it had. But a year ago it was only a turning point, only a compass to steer by. Reliable, resolute, robust settlers who could safely be welcomed to your shores had to be chosen with the greatest care by our trained representatives in Europe. Fields and homes had to be made ready; scientific planning was required. This, we determined, must be no haphazard pouringin of immigrants upon the Western Hemisphere. To build well and wisely, slow, safe and gradual beginnings were essential. Last May the first settlers arrived from war-torn Europe. Today there are only 300 settlers at Sosua. This, year we plan for no more than another thousand. These are pitifully small numbers when we think of the countless thousands of tortured peoples stretching out their hands from overseas. But it is in our minds a matter of absolute essence to lay strong and durable foundations; hence we dare not move more rapidly. On this first anniversary of the signing of the noble Covenant for freedom and equal opportunity in this beautiful and fertile land it is our privilege to render your Government and your countrymen a report of progress. If it is a report of small beginnings, it is also a report of real beginnings.. The Governments of the United States and the Dominican Republic have generously loaned us experts in the fields of agriculture, forestry, electrification etc. We have set up dormitories, homesteads, kitchens, laundries, a school, ail infirmary, a wood-working shop, repair shops, a milking barn and a cheese factory. For the infirmary, we are happy to say, we have had very little use. Our hard-working settlers steadily gain weight and strength. They are bronzed and hardy. Twelve of our settlers already occupy their own homesteads. Sosua is teeming with activity. I-ouse-building, planting, ploughing, milking, road building fill the settlers' busy days. They have found time to build a small theatre. The Governor of Puerto Plata and a large party of his friends were guests at the first perfomance. The favorite diversion of the settlers is horse-back riding. Their leisure is occupied with shoe repairing, reading, lessons in Spanish and agriculture. About 750 acres are under cultivation. We have about 500 head of livestock, also poultry. The settlers have already sold a little cheese.. Peas, beans, potatoes, tomatoes, corn, radishes, papayas and other subsistence crops have been planted. A fairsized tract in coconut trees, has been started. The United States import annually copra and copra products valued at 20 to 30) millions of dollars. Most of this comes from~ distant Ceylon and the Philippines. There is no U. S. import duty on copra. The -planting of thesd coconut trees by th~e settlers is mentioned as an example of our aims. We deem it important not only to help the settlers but to bring into the Dominican Republic new varieties of export crops for the benefit of the entire country. We feel that to have your friendship we must deserve it. SDr Atherton Lee, Director of the Experiment Station of the United States Department of Agriculture at Puerto Rico visited Sosua six months ago. Following his expert advice we have planted a small quantity of grasses for the production of essential oils for which there is an export market. These plants are called lemon grass, citronella grass and ilang-ilang from which perfumes and drugs are manufactured. We hope that extensive growth of these plants may be developed in the Dominican Republic. for export crops. We are preparing to plant limes for which there is a moderate export market. It will take four or five years to produce Mimes for the market on a substantial scale, but we are trying to plan far ahead as well as to deal with immediate subsistence problems. Cacao interests us greatly. The United States annually import 25 to 50 millon dollars of cacao. Only a tiny portion comes from the Dominican Republic, but it has natural advantages in this. country for large growth. We believe it possible to increase and shall do our utmost to aid in expanding the export of cacao from the Dominican Republic. one of value to this country. We are happy to have received your assurance of cooperation in this undertaking. Dr. Lee has made a many years' study of the bamboo. In Japan and the Dutch East Indies this useful tree serves a wide variety of purpose such as for houses, utensils, cattle shelters, irrigation piping and furniture. At Puerto Rico Dr. Lee has developed termite-resisting bamboo. We have obtained from him shoots of these varieties and hope to develop this activity on a substantial scale. We believe it may become of large benefit in this country. 'The Government of the United States is helping us generously with seeds, shoots and cuttings of plants which we wish to introduce into your country. It is with reluctance that I leave this fascinating subject of agricultural plans, studies, projects and possibilities. Time does not permit futher details. I must touch on our industrial studies which have already produced at least one concrete result. This relates to the tenderizing of beef. The Westinghouse Electric and Manufacturing Company has licensed our Association to use freely a recently perfected tenderizing process for beef. This process makes the toughest meat tender. The benefit of this license will accrue not only to the settlers but to the Government and to the people of the Dominican Republic for domestic use without royalty or fee. The possibilities of this process will be apparent to you. The Falk Foundation of Pittsburgh is financing an extensive economic survey under the direction of the well known and highly capable Brooking-s Institute. Dr. Dana Munro, formerly head of the Latin American Division of the United States State Department, a noted fellow-countryman of mine is now, with a staff of experts, in this country for the purpose of making this important study. We trust its results will be of benefit to the settlers and the Republic. You may be assured that every effort will be made to those ends. A few words as to our finances are appropriate. A year ago this Association had a total capital of only $200,000. You took us on faith. You and we both understood that such a sum could do very little. Today our Association has a capital of over a million dollars paid in, or responsibly subscribed. Its authorized capital is now ten-million dollars. This anniversary also marks immediate additions to our capital as you will presently learn. The Association is now expending about 1,000 dollars a week for payrolls to Dominicans carpenters, painters, tinsmiths, laborers. Within the last few months we have expended in this country upwards of 35.000 dollars for building materials wad other supplies. Whenever we can purchase in this country we do so rather than to import. The accountants of the Association both here and in New York are preparing a detailed financial, report of the first year of operation. On completion certified copies will be transmitted to your Government. The plans for settlers include Catholics, Protestants and Jews. Most of the present settlers are of the Jewish faith. This is natural since the Jews were the first and most bitterly persecuted of the peoples of Europe. Today we have appeals from many countries and from Christians as well as Jews. in large number. Within the past few months the Archduke Otto of Austria visited me in New York in behalf of hundreds of oppressed Catholics in Europe. With the permission of your Excellency I have assured him of the readiness of our Association to cooperate with him in order to aid them to come to Sosua provided they are hardy pioneers. Only a few days ago, at my request, the Generalissimo Trujillo met the Archduke and gave him like assurances. It is, my privilege to be the bearer of a letter from the Archduke to your Excellency. of that Committee. He is also one of the most active and effective members of our Association. Its other members include prominent Catholics, Protestants and Jews men of good will dedicated to the cause for which I speak. They have had splendid assistance from the Hon. Isaiah Bowman, President of Johns Hopkins University. His knowledge of refugee resettlement problems is of great value to us. Lessing and William Rosenwald are immensely helpful-ready as they and their family always are to support constructive undertakings. As to the representatives of your Government, I find, your Excellency, that if I were to begin to mention by name the many, many officials and citizens who have given us splendid assistance I should have to present a longer list than Homer's Catalogue of ships. So too in the Departments of State and Agriculture of the United States our efforts have always met with friendly and expert assistance. United States Minister Scotten, Consul Anderson and the Legation and Consular Staffs, Naval Attach6 Butler are our able and friendly advisors. The Honorable R obert T. Pell of the United States State Department who. participated so helpfully with your Excellency and myself and our respective colleagues in preparation of the Covenant a year ago is here with us again today., His aid throughout has been of the highest value. Our energetic fellow director Alfred Waqg, III, is most helpful. country. From my daughter Dr. Elizabeth Rosenberg who is in England helping Sir Herbert Emerson in selecting suitable settlers 1 have just received a cable conveying gratitude of the coming settlers and their petition to help them soon to come to Sosua. Generalissimo gave us his credo. I believe I am quoting him accurately. "I have spoken", he declared, "with burning faith as a Dominican and with enthusiasm as a statesman... I have declared that the two concepts most characteristic of my political ideals are contained in the manifestation of culture and; agriculture; these two words are the sacred theme of my escutcheon of patriotic conviction.... The befriending of all currents of immigration capable of cooperating with the ideals that animate the strengthening of these cultures has always been my keen desire and has always had my ardent support...,. 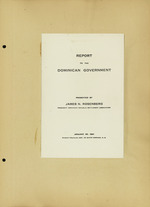 The official approved of the establishment of immigration colonies in this Republic concurs with, my ideals of satesmanship and is at the same time a universal proclamation of the favorable disposition with which the Dominican Republic complies with the sacred duties of a free and hospitable nation offering to the men of other lands and ather races. who have been cast loose upon deplorable adversity, a cordial refuge and generous opportunities". To us, your Excellency, these lofty sentiments will always shine brightly as a beacon light to guide our way. Here we may hope to join humanitarianism with scientific planning for the betterment of men. Here we may hope to bring new life to the oppressed. If we are to live; if civilization is to survive, the days of hatred and oppression must end. Here in this conutry of sunshine and friendliness the seed of hope revives. It becomes our duty and our privilege to bring that seed to flower, to bring you young stalwart men and women in whom you and your conutrymen may rejoice. The Western Hemisphere was peopled and built by *such refugees. It is to bring you such settlers th-at we dedicate ourselves. Four and a half centuries ago Columbus the discoverer wrote to King Ferdinand that this island "is surrounded by many safe and wide harbors.... many great and salubrious rivers flow through it. There are also many high mountains there... a great variety of trees stretching up to the stars, the leaves of which are never shed for I saw them as green and flowering as they usually are in Spain in the month of May.... There are also excellent pine trees, vast plains and meads, fertile plains very suitable for planting and cultivating and for building of homes". Today your country fulfills the promise of that historic letter. Tonight, while the blackout of Europe hides shuddering millions from engines of death, the settlers at Sosua will sleep in peace. When our minds dwell on the tragedies across the seas, a heavy sense of sorrow and responsibility weighs us down. But we are buoyed up; courage and hope lift us when we take note of the great heart and the noble humanity of this small country. Small? So was ancient Greece a small country. So was ancient Judea. Greatness is not charted in terms of geography. It is counted by the souls and spirits of men of good will, It is fitting, therefore, your Excellency, that in the name of oppressed countless thousands to whom the Dominican Republic spells hope and home and haven, I voice again from the depths of my heart a thankfulness which words cannot measure. Words fail. It is for us by deeds to show our gratitude to this nation which so truly practices the precept to love our neghbors as ourselves.